Banjos and Fiddles and Pickers Oh... and Pie! How many times have I heard about the drive between my home city, Topeka, and Western Kansas? Boring? Desolate? Well on my recent trip to Colby, we made a few stops to and fro beginning in Lucas. We stopped to use the restroom and visit the Garden of Eden, a landmark on the National Register. This is a must see, if anything because you walk away wondering about the type of person Mr. Dinsmoor must have been. This has been previously blogged about so I won&apos;t go into detail, but will post some pictures and those alone speak unmeasurable amounts about this home and garden. We also spent time in the Grassroots Art Center where my heart soared taking in the artists&apos; displays. I must add that my favorite work was from someone who used chewing gum as their medium. Unreal. We strolled downtown and sampled homemade words-cannot-describe bologna and chowed down on beef jerky from Brant&apos;s Meat Market. We also browsed the amazing pieces of art in Eric Abraham&apos;s Flying Pig Studio and Gallery (if only I could win the lottery!). And finally the public restroom called the Bowl Plaza. I have never seen a more fantastic bathroom. There, I said it. I went into both the mens and womens, taking in the mosaic art and creations within each locked little room with plumbing. Art + restroom = a one-in-a-million experience. Lucas may be a bit off the beaten path, but it is worth the extra mile. Lunch was at Grandma&apos;s Soda Shop in nearby Wilson, Kansas&apos;s "Czech Capital," and we stopped in numerous antique stores along I-70 but the main event was on the other side of the state in Colby at the Pickin&apos; on the Plains Festival. We were greeted by many locals including Mayor Gary L. Adrian who said he expected a large crowd, an accurate statement. The bluegrass sounds pouring out of the fairgrounds on this 73-degree evening were nothing short of amazing. My foot was worn out from all of the tapping. This was the 18th year for the festival which brought in big talent. We saw Blue Highway, the "Queen of Bluegrass" Rhonda Vincent, Bonham Revue and Jeff Scroggins, all so wonderfully talented and (a little biased here) my favorite-Driven. 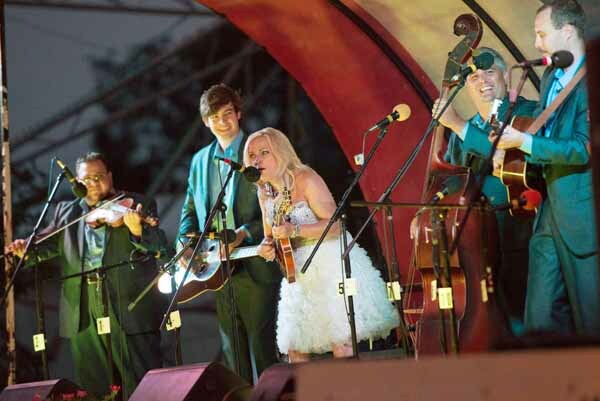 I loved Rhonda Vincent&apos;s act and everyone on stage during the festival was so talented. This was a truly magnificent event but I&apos;m a Kansas girl who has a soft spot for "local" talent. The way the crowd gave a standing ovation, two of the boys from Colby themselves who grew up playing with their family band, mom&apos;s gushings over her sons...not only was there serious pickin&apos;, singing and foot tapping, knee slapping sounds, but a community embracing their own talent that made my heart happy. Their new CD is due out soon and I will be watching for it with anticipation. As I said the event was magnificent. Dodge City Marshal Allen Bailey emceed for the 11th year, his wife joining him, forming one fun team to see. Performers told jokes, signed autographs between performances and the event staff was extremely friendly. The new tent shaded patrons and there were other activities for the younger crowd. I look forward to catching this bluegrass festival again and again. On our way home we turned off of the Interstate to enjoy some Kansas byways. We stopped at the Cottonwood Ranch in Studley, once home to John Fenton Pratt, a Yorkshire native and sheep farmer. We took the self-guided tour, reading the signs that told his family&apos;s story. Finally, we stopped in Nicodemus. The town was very quiet when we met with park ranger Will Pope, a former Topekan. We learned a little about the town that was developed by formerly enslaved African Americans, the oldest remaining settlement of its kind west of the Mississippi. I learned the third full weekend in July there is an annual Emancipation celebration and it sounds like the streets come alive when descendants and reenactors perform such acts as freed slaves arriving in Kansas. We began to leave this small town when we were flagged down by a woman in her car, after all our van stood out and could probably be seen for a mile. The woman, Angela Bates, inquired if we had had lunch and invited us to her place for some barbecue. The home was just down the road and it once belonged to her aunt, Ernestine VanDuVall, who also created the barbecue sauce recipe we enjoyed. The home has been converted into a small restaurant but Bates has big dreams for this site. She served up some delicious ribs, potato salad, beans, dessert and of course, history. I felt more like I was at someone&apos;s dining room table rather than in a restaurant. Bates cooked our lunch while talking about Ernestine, her famous food and the town of Nicodemus. And I did mention dessert. One of the local ladies makes the peach cobbler and lemon meringue pie which we were happy to indulge in. Bates currently operates an Ernestine&apos;s in Bogue as well and sells her jars of sauce. A full weekend indeed, and most likely a completely different trip than what it would have been with my three kids. Thanks Mom and Dad for keeping them so I could go enjoy Kansas!